Social media reporters often cover Dell, and with good reason: Dell got in on corporate social media early, and worked hard to get it right. They've created everything from a Social Media Listening Command Center, to in-person Social Think Tanks, to a Social Media & Communities training program for employees. I heard the story beginning to end from Richard Margetic, Dell's Director of Global Social Media. He explained that Dell launched its first social media outreach team in 2006, and he enumerated a dizzying array of programs that followed. "At first we were just looking for conversations, being transparent," said Margetic. "The words that we were using were ‘trusted advisor.’"
2006 was way ahead of the curve for brands engaging socially. (As a benchmark: Facebook Pages didn't exist; those arrived in 2007.) That meant that there was little advice available and an experimental attitude was crucial. One person who helped Dell establish their Twitter program is Ricardo Guerrero, a former Dell employee who is now a consultant. Guerrero emphasized that after he took the initiative to try new things, Dell was smart enough to give him space to experiment. "Dell never said, 'You did what?!'" Guerrero told me. "They just said, 'Okay, cool. Thanks. Let's see what happens now.'" This is not to say that the executives were totally hands-off. Richard Margetic explained that, "In order to scale, we had to be able to prove that the business was getting a benefit as well as the customers. We spent the entire summer of 2008 with four of us locked in a room 90 minutes, Monday through Friday, doing a deep dive into how we could get social media into a situation where it is valued by the company while giving value to customers." 90 minutes, five days per week, is an awful lot of time for high-level employees to spend on something unfamiliar and unproven. Still, their thoughtfulness paid off. One of the most interesting things about the Dell training program is that it abstracts social media by type, rather than focusing on specific platforms. Instead of training specifically for, say, Twitter, Dell has taken a step back: they train for blogging (e.g. Wordpress), micro-blogging (e.g. Twitter), business networks (e.g. LinkedIn), and so on. Employees who go through the social media training program learn about social policy, tone, and legal issues, and they also receive general training for "how to engage in communities." 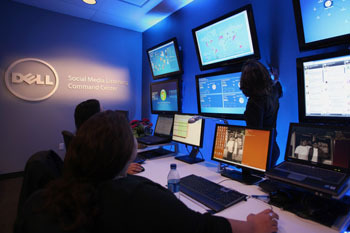 By now, Margetic said, social is thoroughly integrated across Dell. "Our content people are fully trained in social. In SEO, we've got a person whose job is to relate it to social. In legal, we've got a person whose sole responsibility is to be there everyday to understand what's happening in social. Somehow, during this social whirl, content strategy got a bit silo'd -- but Dell is working on it. I spoke to Colleen Jones, author of Clout: The Art And Science of Influential Web Content, who recently consulted with Dell. She said, "When I started working with Dell, they had seen the benefit of content strategy for particular projects or engagements and realized that they needed to scale it. Some teams would start to create content and then other teams would create the same content, or they'd have gaps in some areas where no one was creating content to cover it. The challenges for them were around, 'how do we do this consistently for every kind of content, from marketing to tech support to customer service? How do we operationalize that?'" So -- similarly to their approach to social media -- Jones helped Dell create training on the fundamentals of content strategy. "From start to finish, we involved all the different people who touch content," she said. "Everyone heard a little bit about each other's perspective, like the consequences of lack of planning up front for someone who gets the content later. The productive conversation that we had in bringing those people together went a long way towards making the training effective. The second success that we had was introducing common vocabulary for content strategy. We got on the same page of what content strategy means, what are the phases of it, what each phase means, and some tools to help implement it." Sometimes I think that the primary mistake corporations make, when it comes to digital media, is believing that content and/or social media is easy and/or free. Even if you're not paying for digital media opportunities, they're not free: getting them right requires time and effort. But brands that invested early in understanding social media are gaining dividends now, both internally and as thought leaders. Corporations that get ahead of the curve on scaling social will gain similar dividends. Sign up to hear more from big brand strategies within our forthcoming industry report, Brandopolis. The full report lands on 23rd October with hard won stories from Facebook, Coca-Cola and L'Oréal to name but a few.